Area school districts cancel school on Wednesday because of weather – Welcome to Wyandotte Daily! Ice and snow in Wyandotte County on Tuesday night have resulted in area school districts announcing that school will be canceled on Wednesday. Districts including Kansas City, Kansas, Public Schools, Turner Public Schools, Piper Public Schools and Bonner Springs-Edwardsville Public Schools have announced that classes will be canceled Wednesday. A winter weather advisory is in effect from Tuesday night through 6 a.m. Wednesday, according to the National Weather Service. 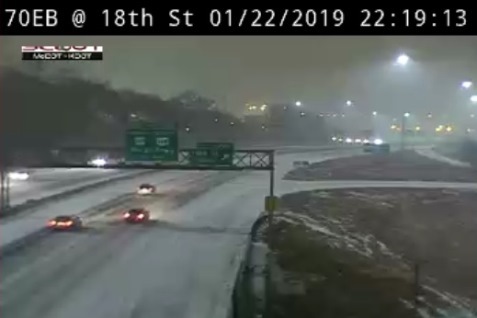 Snow was falling at 10 p.m. Tuesday in Wyandotte County, and freezing rain fell previously, creating a layer of ice under the snow. The weather service says snow and freezing drizzle may continue to 3 a.m., then snow after 3 a.m.
Tonight’s low will be 16 degrees, with a southwest wind of 7 to 17 becoming north northwest in the evening, and gusting as high as 31 mph. Wednesday, there is a 20 percent chance of snow before 8 a.m. The day will begin with clouds that will gradually clear, with a high near 30, the weather service said. Winds may gust as high as 22 mph on Wednesday.